(Pictures are stock photo and item may vary slightly). 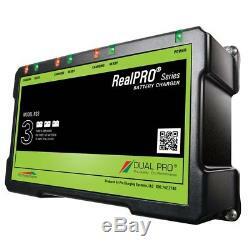 Dual Pro RealPRO Series Battery Charger - 18A - 3-6A-Banks - 12V-36V. RealPRO Series Battery Charger - 18A - 3-6A-Banks - 12V-36V. RealPro Series battery chargers (formerly Recreation Series) are an affordable, reliable and safe battery charging system designed for everyday use. The system is engineered for users who need a charging system on an occasional basis and may not want or need the capabilities of a heavier duty and higher amperage product. It is designed for use in many types of applications including bass boats, runabouts, pontoon boats, other watercraft, automobiles, ATVs, golf carts and other similar uses. The system delivers sophisticated capabilities and superior value to customers. Battery Charging Systems Designed for Everyday Applications. Unmatched Performance, Reliability, Safety and Quality. TROUBLE FREE - Just Plug It In and Forget It! Join Over 750,000 of Our Satisfied Customers! Universal Input (100-240 VAC 50/60HZ). Approved for Wet Cell and Absorbed Glass Mat (AGM) batteries. Designed for use in fresh and salt water. Dependable, rugged construction and waterproof. Independent outputs and fully automatic. DC charge cables = 5ft and AC power cord = 3ft. Approved and meets ISO 8846 Marine standards. Models available to charge 12-24V systems. LED lights indicate "Each Battery's" state of charge. Reverse polarity protected and no installation restrictions. Ignition protected (US Coast Guard 33 CFR 183.410). FCC 15 Parts A and B Interference Compliant. May be used in many types of sporting applications including. Pounds: 13.00 Ounces: 0.00 Package Depth: 5.00 Inches Package Length: 11.00 Inches Package Width: 8.00 Inches. Orders are automatically processed through our system. Please make sure your address is correct at checkout and you are certain of what you are ordering. Orders are not always able to be canceled once processed. We have added additional cost for these areas. Please assume all electrical items are made to work on 120V or 12V systems unless otherwise noted in the description. Please inquire with us in case this is not acceptable and we may make an exception. Please check with local officials regarding cost and proper procedures for labeling. Item must be Brand New in box, no exceptions. We cannot return any installed, used, broken parts unless they are non-working upon arrival. Map cards are NON returnable. Most items we sell are covered by manufacturers' warranties. Some of the products on this website can expose you to chemicals including lead, which is known by the State of California to cause cancer and reproductive harm. For more information please go to. Powered by SixBit's eCommerce Solution. The item "Dual Pro Realpro Series 18A 3 Bank Battery Charger" is in sale since Friday, October 20, 2017. This item is in the category "Consumer Electronics\Vehicle Electronics & GPS\Other Vehicle Electronics". The seller is "wakezonemarine" and is located in Bayville, New Jersey. This item can be shipped to United States, Canada, United Kingdom, Denmark, Romania, Slovakia, Bulgaria, Czech republic, Finland, Hungary, Latvia, Lithuania, Malta, Estonia, Australia, Greece, Portugal, Cyprus, Slovenia, Japan, China, Sweden, South Korea, Indonesia, Taiwan, South africa, Thailand, Belgium, France, Hong Kong, Ireland, Netherlands, Poland, Spain, Italy, Germany, Austria, Israel, Mexico, New Zealand, Philippines, Singapore, Switzerland, Norway, Saudi arabia, Ukraine, United arab emirates, Qatar, Kuwait, Bahrain, Croatia, Malaysia, Brazil, Chile, Colombia, Costa rica, Dominican republic, Panama, Trinidad and tobago, Guatemala, El salvador, Honduras, Jamaica, Bahamas, Viet nam.